LET'S GET BUSY...TBS is getting a little more flava. The network just announced a deal with George Lopez. The actor/comedian will helm a late-night talk show--one that should make Arsenio Hall proud. Lopez says he wants the show to have a spontaneous, street-party atmosphere. If Lopez lives up to his promises and TBS properly promotes the show, they could have a winner on his hands. Late-night fare has been screaming for some color since Hall left the building. NPR'S MEA CULPA?...National Public Radio is saying it's sorry it axed the last of its African-American shows. NPR CEO Vivian Schiller recently announced that it canceled "News & Notes" because too few stations carried the Black news program. But, she added, that all other NPR shows will now "reflect the full spectrum of our listenership, or our potential listenership...we need to make sure that we are constantly thinking about a diversity of audience. So rather than having a special program that is just for African Americans or a special program that is just for Latino listeners, we needed to be represented in the fabric of everything that we do." While diversity in coverage across the board is a no-brainer, some might say this is a cop out from NPR in not putting funding into a show that could truly offer news and views from a Black perspective. IMAGE ONLY...According to a recent report by the Associated Press, Madison Avenue in the age of Obama is already producing commercials projecting diversity and racial harmony. From Pepsi's newest spot "Refresh Anthem" to E Trade's latest commercial featuring its usual White baby and now a Black infant, the ad world is being more inclusive. But The A-List wants to ask: How many ad dollars are being spent in Black media outlets? How many creatives of color are being used? HERE HE COMES AGAIN...It doesn't look like Tyler Perry is going to go away any time soon--or that filmgoers will tire of his Madea schtick. Hot on the heels of the success of Madea Goes to Jail, which has grossed more than $66 million in North America thus far, Perry just begun work on his next project. I Can Do Bad All By Myself, based on Perry's play of the same name, is shooting at his newly opened studio in Atlanta. Perry, of course will star and Madea will make an appearance, but he's also he's pulled in Oscar-nominated Taraji P. Henson. The Lionsgate flick is to open September 11, after which Perry will film his sequel to 2007's Why Did I Get Married?, a Easter weekend 2010 release. BEEN THERE...The story of the Tuskegee Airmen has been told and retold. But here's a new twist; singers Ne-Yo and Jazmine Sullivan are set to hit the big screen in yet another movie about the legendary black fighter pilots, Red Tails. Taping starts soon in Prague. Good to see Black history getting film treatment, but why rehash a story that's already been put on reel. There are so many other untold stories of the African-American experience that have yet to be been told. TRIBECA NEWS...The Tribeca Film Festival announced that the ESPN Films production of Spike Lee’s Kobe Doin’ Work will have its world premiere at the fest on April 25. The flick about Kobe Bryant is sure to attract attention. We'll be there to bring you updated news. QUICK TAKES...Want to expose your film to the Caribbean moviegoer? Enter the Bridgetown Film Festival, happening June 10-14 this year. For info on how to submit your flick, email filmgroup@sunbeach.net or check out the fest's MySpace and Facebook pages. Deadline: April * 30...Make way for another Richard Pryor bio pick. Eddie Murphy will play Pryor and Oscar-winning writer Bill Condon (Dreamgirls) is attached to the project as well. More details on this later...If you haven't heard, David Alan Grier's attempt at satirical news show on The Comedy Channel, "Chocolate News" has been canceled...Just in: Chris Rock, Tracy Morgan, and Martin Lawrence are teaming up to do a remake of the British Death at a Funeral. This could be comedy's new dream team...Whoopi Goldberg is one busy lady. "The View" co-host just announced she will joining the A&E drama, "The Cleaner," for a multi-episode part. She'll play the former spouse of Benjamin Bratt's character...If you didn't read the credits on the March 26 episode of "30 ROCK," entitled “Apollo, Apollo,” then you missed that it was directed by Millicent Shelton. You go, girl! JERSEY IN THE HOUSE...if you're in Newark, check out the Alternate Routes Hip Hop Fest, April 1-4 at the New Jersey Performing Arts Center. There'll be spoken word jams, open mics and hip hop film screenings--all free. Among the film screenings, which will also include panel discussions, are The Hip Hop Project and The Other Side of Hip Hop: The Sixth Element. For more info, visit njpachiphop.org. IT'S A BIG DADDY KANE THING...Funny how we recently mentioned the ride of hip-hop bio pics. Now comes word that the life of Big Daddy Kane will make its way to the big screen in the form of a feature-length doc called BDK. The film covers Kane's start growing up in Brooklyn to his rise to success. The film will be directed by Anthony Marshall, co-founder of the famed Lyricist Lounge. Morgan Freeman filmin' in Cape Town, South Africa, with Matt Damon in a Clint Eastwood-directed film called Human Factor about Nelson Mandela’s attempts to unify the country after apartheid. Freeman stars as Mandela in the Warner Bros. film. "Law & Order" alum Jesse Martin shootin' a new NBC series in Cape Town entitled "The Philanthropist." The production is actually based in London and filming in South Africa and the Czech Republic. 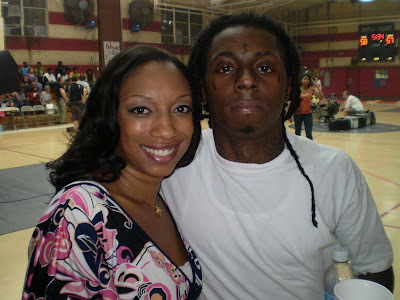 Lil Wayne and actress Jalene Mack chillin' on the New Orleans set of Hurricane Season, also starring Forest Whitaker, Oscar nominee Taraji P. Henson and Bow Wow. The A-List will go on hiatus following our upcoming coverage of Cannes.